Ivana Baquero Photos, News, and Videos | Just Jared Jr.
We can’t tell you how much we miss The Shannara Chronicles – so we were so happy to see these new pics of Eretria Ivana Baquero! The 24-year-old actress and co-star Jon Kortajarena were seen out at the 2018 GQ Men of the Year Awards at the Palace Hotel in Madrid, Spain. The two are starring in Netflix’s upcoming Spanish series, High Seas. The series is an eight-episode mystery-drama series set in the 1940s, and centers on a transatlantic ship full of passengers, traveling from Europe to South America in search of a better future. Premiering next year, High Seas focuses on two sisters, Carolina (Alejandra Onieva) and Eva (Baquero), as different as they are inseparable, a handsome officer, Nicolás Sala (Kortajarena), a man that fate has put in the wrong place and a mystery: the murder of a passenger whose name does not appear in the passenger list and who no one remembers. Ivana is also pictured at the premiere of Fantastic Beasts: The Crimes of Grindelwald premiere in Madrid earlier in the month. Ivana Baquero looks cute and fun in her feature for NKD Magazine! 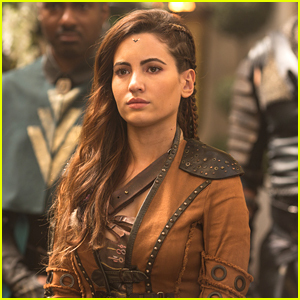 The 23-year-old actress dished on her role in The Shannara Chronicles, her first television show! The Shannara Chronicles will air its’ final two episodes of the second season later tonight — and to be honest, we are just not ready for it to end! It seems that the second season of the fantasy television series just started and it looks like Ivana Baquero, who plays Eretria, is starting a campaign for a third season with the fans of the show. Speaking with TV Junkies recently, Ivana opened up about how Eretria’s sexuality wants her to keep telling these stories. We are so game for a third season…and a fourth and fifth, too. Anyone else? Stay tuned for a sneak peek of tonight’s season finale! There aren’t that many shows where you really do see a positive, and still standing LGBTQ relationship at the moment — but The Shannara Chronicles is doing it. Star Ivana Baquero, who plays Eretria on the Spike series, calls herself one of the lucky ones to be able to be a part of the conversation. 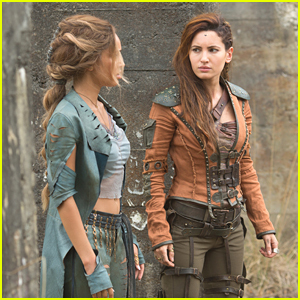 Ivana says that Eretria’s relationship with Lyria actually came as a surprise to her for season two. The Shannara Chronicles airs Wednesdays on Spike. 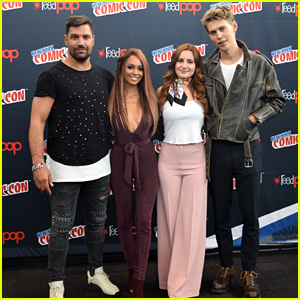 Austin Butler teams up with his co-stars Vanessa Morgan, Ivana Baquero, and Manu Bennett for a shot on the press line during 2017 New York Comic Con over the weekend. The Shannara Chronicles stars spoke about the upcoming second season, which premieres on Wednesday on Spike. In the new season, it’s a year later and people are not reacting to the re-introduction of magic well and it’s something that Austin‘s Wil is feeling too, and in despair. Meanwhile, Manu (Allanon) opened up about one scene that even took him by surprise. Be sure to check back for more Shannara info and tune into the premiere on Wednesday, October 11th on Spike!